The goal? To see how these two classroom experiences differ, and whether or not schools can level the playing field. You can see the disparities between the two schools the minute you walk into the classrooms. 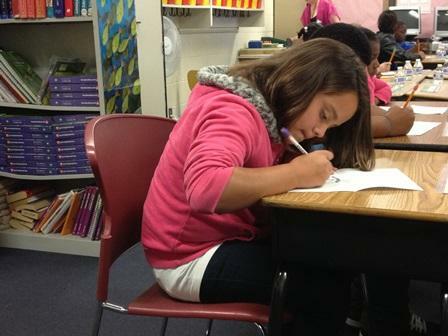 School X is filled to capacity with high-needs kids, the room is loud, and the teacher is brand new to 5th grade. The middle class school in Novi is well-stocked and spacious, and the teachers have been teaching 5th grade for pretty much their entire careers. Like a lot of high-poverty schools, teacher turnover plagues School X. The principal says she has to replace 60% of her staff every year. Studies show high teacher turnover can have drastic effects on student achievement, especially for at-risk kids. Novi receives about $750 more in per pupil funding than School X. As MSU education policy wonk David Arsen points out, "one might think that in the district where the children are coming less well-prepared from the home for academic outcomes, that they receive additional resources to make up. We don’t do that in Michigan." Some say poor schools need more money, others say schools get enough money, they just need to figure out how to better use it; some say we need to re-think the way schools are used so that they stay open late to provide health and human services for kids and their families. Studies suggest that economically integrated schools are more successful at boosting student achievement than improvements to high-poverty schools alone. But economically integrated schools are hard to come by; often poor kids go to school with poor kids, rich kids with rich kids. One Harvard scholar says if people wanted, they could change that. She says states could change school district boundaries to get a mix of inner city, older suburb and new suburb. The glitch? "It’s not going to happen politically," says Jennifer Hochschild, "but it’s not technically difficult to do."